Wow! Me, my blog? 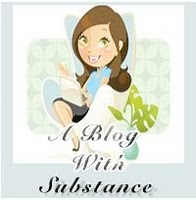 A blog with substance? I'm flattered and speechless. Thank you, Thank you, Thank you Crystalrainbow! Pass it on to 10 other blogs which you feel have real substance. I've been struggling lately with the whole should I stay or should I go. Whether I'm doing the right thing, or being selfish and self-centered. Am I throwing it all away? Is everything all in my head? It's such a difficult time I find myself in...I feel like I'm between a rock and a hard place some days. I question whether leaving is the right thing to do for me, for the girls...if taking them one of these days out of the only home they've ever known is the right move...if by focusing on what I want or need makes me a selfish person. Today I decided to consult my Tarot cards, as well as try out a few of those online Tarot readings. Out of about 6 different ones I did, one card came up almost every time. It was the Eight of Cups. Basically from everything I was able to read about the card, it's telling me it is time for a change. That it's time to move on, to get out, things in my situation will not change. That I know what I need to do and that I need do it. I don't know where or how I will find the means to leave. I'm so afraid of leaving. I'm afraid of what he might do. I'm afraid that my youngest won't want to leave. I'm afraid that by leaving I'm being selfish. I'm afraid that I won't be able to make it out there. Then of course the other thing is where do I go if I did leave soon. And what if my youngest doesn't want to go to? But, the cards were clear that leaving is what I must do.